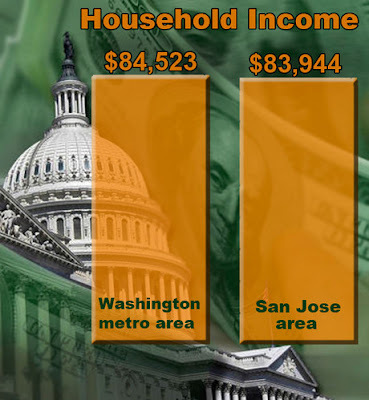 CARPE DIEM: Washington DC Has Highest Median Household Income, As Wall Street Moved to K Street. OKS? Washington DC Has Highest Median Household Income, As Wall Street Moved to K Street. OKS? BLOOMBERG -- "Federal employees whose compensation averages more than $126,000 and the nation’s greatest concentration of lawyers helped Washington edge out San Jose as the wealthiest U.S. metropolitan area, government data show. The U.S. capital has swapped top spots with Silicon Valley, according to recent Census Bureau figures, with the typical household in the Washington metro area earning $84,523 last year. The national median income for 2010 was $50,046. The figures demonstrate how the nation’s political and financial classes are prospering as the economy struggles with unemployment above 9 percent and thousands of Americans protest in the streets against income disparity, said Kevin Zeese, director of Prosperity Agenda, a Baltimore-based advocacy group trying to narrow the divide between rich and poor. “There’s a gap that’s isolating Washington from the reality of the rest of the country,” Zeese said. “They just get more and more out of touch." In recent years Washington has attracted more lobbyists and firms with an interest in the health-care overhaul and financial regulations signed into law by President Barack Obama, according to local business leaders. “Wall Street has moved to K Street,” said Barbara Lang, president and chief executive officer of the DC Chamber of Commerce, referring to the Washington street that’s home to prominent lobbying firms. 'Those two industries clearly have grown in our city.'" MP: Considering that Washington has the highest median income in the country thanks to all of the lawyers and lobbyists, and all of the federal employees earning compensation that averaged $126,369 last year, OWS might have the wrong target. After all, it was government housing policies originating in Washington that contributed more significantly to the housing bubble, mortgage meltdown, financial crisis and economic recession than any greed on Wall Street. Based on a new Gallup Poll (ht: Economix Blog), the American people understand this, and they are more than twice as likely to blame the federal government in Washington (64%) than financial institutions on Wall Street (30%) for the economic problems facing the U.S. How about: Occupy K Street? Or Occupy 1st Street SE? Have you heard? Rick Perry has introduced his groundbreaking 8-8-8 plan, that is almost 10% better than the competing plan. Also, Pres. Obama has introduced a new 68-68-68 plan, but only for millionaires that earn more thank 100k a year. On a more related note, I fear that many of the people that blame Washington for the current economic woes are blaming Bush. I believe that is inaccurate, but probably less inaccurate than blaming Wall Street. What is funny is that people blame Bush for spending so much, and don't blame the next president who is spending far more. Stimulus, hell, isn't the dramatic increases in spending on the budget and various agencies really stimulus 2-4, and this current half a trillion will be failed stimulus 5. For the other third that blame Wall Street, why do you blame them for getting bailed out? I don't get it. I also don't get how lending people money they can't afford is somehow a "predatory loan." If I lend you money that I know you can't pay back, how am I predating you? I am the one that is going to be suffering, more than you, especially if you declare bankruptcy or just stop paying me. As for DC, yes it has a lot of lawyers, what is wrong with that? Are we now blaming lawyers for the economy? Speaking as a lawyer, I didn't do anything to hurt the economy - I spend my working time trying to help my employer avoid inadvertently violating the tons of employment laws out there. Blame those labyrinthine laws on the government, not on me! DC also has a robust housing market, at least compared to the rest of the country. All those well off federal employees. Wish they would rent my condo, I am having trouble getting that thing to move. Productive (Silcon Valley) vs Regulation (WashDC). Thomas Jefferson's prophetic word has come to pass! This chart represents the Obama economy better than any other. Note that silicon valley hasn't been doing badly during the past decade, with Apple, based out of Cupertino, rising from near bankruptcy to become the largest company in the world, just ahead of Exxon, and Google going from startup to tech behemoth. Yet, the govt capital has done even better, as it robs more from everyone. Marko, you may claim to be a good lawyer, but you can't deny that many lawyers do more harm than good, particularly those that write those dumb laws. We will always need someone like you to parse legal contracts, but you can't deny that there are many lawyers who are now doing much worse things, say John Edwards with his class-action lawsuits. Sprewell, I didn't claim to be a good lawyer, although I do think I am very good at my job. What I claimed was that I should not be blamed for the laws I neither wrote nor have the power to enforce. I, like almost every lawyer, just represent my clients by advising them on how to comply with the law and representing them in court. While a small handfull of lawyers employed by legislative bodies (government employees) usually draft the the laws, no lawyer that is not in a legislature can make what they drafted into law - you need a legislative body for that (except for common law, which is written by judges, but that has mostly been drowned in a sea of statutes). If you don't like the laws, it is because the representatives the public has elected have enacted those laws. Don't blame the lawyers! If anything, blame the litigants that hire the lawyers. Edwards is a special case - the laws are written in such a way that they can be used to blackmail companies into paying off the plaintiffs to avoid massive legal fees. I suppose you can blame Edwards for exploiting these laws, but I think the blame really rests on those that gave us the law in the first place - lawmakers. If they don't like these laws, they can change them. I can't change the laws, all I can do is lobby and vote. Marko, obviously I meant that you claim to be a lawyer that does good, which is clear when I followed that by pointing out that most lawyers do more harm than good. You may not have written any laws, but nobody blamed you: we blame lawyers generally and most of those congressional "representatives" are lawyers. You may only represent your clients but you err by saying that almost every lawyer does that, as many do lobby for the laws that they want, whether the tax lawyers for more exceptions they can exploit or Edwards for his scams. The litigants are lawyers, that's the problem, they merely serve themselves, such as when they pass all kinds of laws to protect themselves from competition. And what did Edwards become after blackmailing companies? A lawmaker. It is silly of you to throw it all back on voters, when you well know that most of your lawyer colleagues are carefully stacking the system in their favor, just like the doctors do. We could certainly get by with fewer federal employees. But to just impose an across-the-board salary cut would not be the right solution. There are SOME federal agencies that are doing useful work (e.g., air traffic controllers, FAA, FBI, PTO, NIH, CIA, federal judges, and yes, even the dreaded IRS). We don't necessarily want the quality of work in ALL federal agencies to decline precipitously. I have no beef with lawyers in general, only those who "go after" big companies because they're big. In that context, lawyers cannot blame anyone else for their own zealousness, or for the laws that permit them to extract wealth from corporations (and ultimately from the customers of corporations). I honestly don't know if Mark is too dense to understand the point of the protests or if he knows what he's saying makes no sense but says it in order to fulfill the role of harming the poor to help the rich. I can't believe he's this dense, but it's hard to believe he's that big of a cynic either. Not sure what to make of this. The problem is not that some people are wealthy and we hate that. The problem is that some people acquired their wealth by breaking the law, but because they buy influence in Washington laws don't apply to them. Take Goldman Sachs. It's illegal to sell a product and tell your client it's a great investment even though you know it's terrible. GS tells pension funds that derivatives are AAA products and a real secure investment. As soon as they hoodwink them they laugh about it. We have the emails. They knew it was a terrible deal. So they sold a crappy product and made tons of money. They they bet that the product would fail and when it did they made tons of money. Then after making all that money that took a bailout, which they didn't need. So you work really hard and you get a community organizer elected as President. You assume he might enforce the law, maybe tighten the rules a bit so GS and others can't put the whole financial system at risk. Nope. Obama staffs the treasury with GS employees. He's also the top fund raiser among the financials. Working through the democratic process is pointless. The real power is at GS and the other financials, as well as other business interests. They are wrecking the country forcing politicians to serve them instead of the rest of the population. To fail to see that, and to instead think they should just object to whichever city happens to be the richest, is either a display of willful blindness or cynicism and I'm not sure which. Another example of why at this point it's clear voting is pointless. The war in Afghanistan is opposed by huge majorities. The whole war makes no sense. What a lot of people don't know is that the Taliban repeatedly offered to hand OBL for trial both prior to and following the initiation of the bombing (see here and here). Why fight a war the public opposes and that is against people that did nothing to us, especially when they are cooperating? We all know the reason. War is extremely profitable for some sectors of the economy. The center of the profit seeking world is at Wall St. So the war makes sense when you recognize who it is that our government serves. Ostensibly it is people but in reality it is mega corporations. You may wonder why you never knew that the Taliban offered to hand over OBL. There's lots of important stuff you don't hear about a lot, like massive US backed Nazi like massacres. The reason you don't hear is because what you here comes via the mainstream media. Who are they? Mega corporations. Who are their customers? It's not the viewers. It's the super wealthy advertising corporations. So take NBC, owned by GE, a defense contractor. What view of the world would you expect to emerge from NBC? One that serves their profit seeking interest. So stories of Nazi like crimes aren't in that interest. So it's not discussed. Not hidden. Maybe mentioned quietly. They aren't lying about it. They just aren't talking about it. Why? Profits. What drives profits? Wall St. The protestors are precisely where they should be. Since Occupy Wall Street wants to forgive all debts, if it looks like they will win, I’m going to max out the credit card. On ammo. I think this is the start of the entitlement riots I’ve been predicting for some time, because government cannot possible redeem its trillions of dollars in pledges. OWS is the failure of American Education made manifest. If all of OWS’s demands were met, 50% to 80% of the American population would die of hunger, exposure or violence in the next five years. I will link to this from my Old Jarhead blog. After Ronald Reagan left office the Republicans went over to the dark side and supported big government. The result is a Command Economy with government firmly in control of “the commanding heights” of the economy. In a command economy government influence is as or more important than product. Hence, money flows to Washington. Jon: "So you work really hard and you get a community organizer elected as President. You assume he might enforce the law, maybe tighten the rules a bit so GS and others can't put the whole financial system at risk. Nope. Obama staffs the treasury with GS employees. He's also the top fund raiser among the financials." So, we have YOU to thank for that disaster in office? Nice work, Jon. Maybe you now know that someone whose only real world experience is that of community organizer, isn't qualified to be President. Most of us knew before the election that BHO was a worse choice than even that harpy that now works for him, and that's really saying something. "Working through the democratic process is pointless. The real power is at GS and the other financials, as well as other business interests." Nope, it's not too late yet. The real power is in the hands of each of us as sovereign individuals, but we have to stop making stupid choices. As long as people like you keep electing community organizers, we will be in deep trouble. "They are wrecking the country forcing politicians to serve them instead of the rest of the population." They are "forcing" them by "forcing" money into their hands. There are buyers, and buyees. It seems silly to just rage against the buyers, as OWS is doing. Why are the buyees being given a pass? You should understand that more often than breaking the law, business interests pay politicians who will make laws favorable to their financial supporters. What you may praise as tighter regulation, is often something that large businesses have lobbied for, as it protects them from competition, which is the real control on business. Look up from that Chomsky you're reading Jon, see these things for what they are. Jon: "(see here and here)." You should be aware the the term "Bush Doctrine" was never actually used by Bush to describe a particular policy, but was used by pundits and reporters to describe almost every policy Bush ever pursued, including withdrawal from the Kyoto Protocol. Jon: "You may wonder why you never knew that the Taliban offered to hand over OBL." Everyone knows about that, Jon. Why do you believe otherwise? It was often in the news at the time. Where were you? You should consider the possibility that it wasn't a serious offer, but only a tactic to gain time. Politics and diplomatic jousting aren't unique to the Western World, you know. "I honestly don't know if Mark is too dense to understand the point of the protests..."
Why would you believe that someone who may not share your views is dense? "...or if he knows what he's saying makes no sense but says it in order to fulfill the role of harming the poor to help the rich." LOL Listen to yourself! Do you WANT people to laugh at your comments? Get a grip. TartanMarine: "Since Occupy Wall Street wants to forgive all debts, if it looks like they will win, I’m going to max out the credit card. On ammo." That's probably not a bad idea. Even if you don't need it all yourself, its value should soar as the USD becomes worthless. "Everyone knows about that, Jon. Why do you believe otherwise?" Jon does that alot, he thinks the masses are a bunch of drooling imbeciles who need people like Jon, or Fidel Castro, to control their lives. The offer was most likely a stall, but I don't know anyone, outside of Jon's anti-American buddies, who would have gone along with the Taliban supposedly handing bin Laden over to some unknown 3rd country. I didn't vote for Obama. I could see through his rhetoric at the time. But I think a lot of the people at OWS were hoodwinked and I understand why. Obama presented himself as a liberal, but was very vague. Hope, change, etc. People just assumed that meant he'd be different in substantial ways from Bush. If you read between the lines, as I did, you knew that wasn't true, but most people are too busy just trying to get food on the table than to do research projects on stuff like this. I don't believe that. Mark doesn't have to agree with the protestors. He does have to understand what their objections are if he's going to criticize them. He shows here that he doesn't understand. The Taliban's offer could have been a stall, but it's worth pursuing because it could spare us of war, which would save both American life and Afghan life. Nobody would have considered a peaceful alternative like that? Get outside your bubble and ask some of your non neocon acquaintances. I bet they would. The Taliban is made up of humans with the same kind of DNA you and I have. Bombs are falling and they face loss of power or they hand over OBL to a third party. They are interested in self preservation like normal humans. It probably gives you comfort to pretend they are irrational animals, but it's not true. "Another example of why at this point it's clear voting is pointless." Jon, I can't tell you how happy I am to hear you believe that voting is pointless. I hope you practice what you preach. "pointing out that most lawyers do more harm than good." This is preposterous and frankly offensive. Do you know most lawyers? From your comments, I can't help forming the opinion that you have no idea what you are talking about. Unfortunately, your ideas seem to be widely held. If it makes you feel good to blame lawyers rather than the laws, the people who created the laws, and the people that voted in the people that wrong the laws, then have fun with that. "I have no beef with lawyers in general, only those who "go after" big companies because they're big. In that context, lawyers cannot blame anyone else for their own zealousness, or for the laws that permit them to extract wealth from corporations (and ultimately from the customers of corporations)." I fight the lawyers that go after big companies all the time (I represent big companies) and I don't blame those lawyers. I don't blame them for being zealous, since our rules of professional responsibility require us to be zealous advocates for our clients. We are supposed to use every trick in the book to win. If we go outside the book we get in trouble - sounds like you don't like the book. It is an adversarial system, it is supposed to work like that. What has gone wrong is that many years of liberals messing with the legal system and creating crazy laws has made it almost impossible for corporations to defend themselves. Yes, the trial lawyers have a lobby, but I can't blame people for lobbying their government - that is a constitutional right and if you take it away you better get my ammo while I am not looking too. You can't blame industries that are heavily regulated for trying to influence the system - you have to fix the system. Vote for serious economic conservatives - if we all did that we could fix this crap. But no, we keep voting in liberals with their tort reform and laws to protect workers and laws to prevent stuff we don't like instead of letting the market work. My argument is pointless isn't it - people will continue to blame lawyers (like blaming the messenger), most especially those that went through a divorce and hate their spouse's attorney. "I didn't vote for Obama." So what nut job did you vote for? "The Taliban's offer could have been a stall, but it's worth pursuing because it could spare us of war, which would save both American life and Afghan life." And Al Qaeda life, especially bin Laden's in that unspecified 3rd country. "Nobody would have considered a peaceful alternative like that?" I did say anti-American turds would have been up for it. Nobody else though. "They are interested in self preservation like normal humans." Jon: "I honestly don't know if Mark is too dense to understand the point of the protests or if he knows what he's saying makes no sense but says it in order to fulfill the role of harming the poor to help the rich." Jon: "I don't believe that. Mark doesn't have to agree with the protestors." Jon: "So you work really hard and you get a community organizer elected as President. You assume he might enforce the law, maybe tighten the rules a bit so GS and others can't put the whole financial system at risk." Jon: "I didn't vote for Obama. I could see through his rhetoric at the time." I don't generally have trouble reading, or understanding what I read, so either you are one of the worst writers in the world, or you are changing your tune. If the former, you may want to work on writing more clearly, if you want your views to be understood by others. "Jon does that alot, he thinks the masses are a bunch of drooling imbeciles who need people like Jon, or Fidel Castro, to control their lives. " Yeah, I know. It's becoming tedious to read the same nonsense over & over..
"Yes, the trial lawyers have a lobby, but I can't blame people for lobbying their government - that is a constitutional right and if you take it away you better get my ammo while I am not looking too"
So what you're saying is that the lobbying is ethical as long as it's legal? So I.O.W., if a given interest group (let's pick one that you really dislike) lobbies the government, and the group does it within confines of the law (a law, perhaps, that the group itself helped to create), then NOTHING is ever "wrong" or "unethical" or "unfair". Jon, your whole narrative contradicts your thesis that people have information hidden from them. If the OBL offer wasn't publicized, how do you know about it, some special Taliban backchannel that you have? ;) Of course not, you read about it in publicly available sources and constructed your narrative from that publicly available data. Of course, your narrative is factually inaccurate in parts or heavily skewed to leave out contradictory information, and you will no doubt claim that your data was not widely publicized in mainstream media. But to blame profits is just silly, that's like setting up your protest in Silicon Valley because people primarily get their news online these days. Online news and profits are simply tools towards an end, and it is largely those in DC who abused those tools towards their own ends. Those who did dumb things on Wall Street mostly no longer run large enterprises, as the market punishes, but Barney Frank and other govt failures were given more power after demonstrable and massive failure: that's the real problem. Tartan, breathe, ;) these thousand or so protesters on Wall Street could never muster anything like that. As Stossel has pointed out, what's remarkable about our protests is how few there are, likely because we are so rich that 9% unemployment is not as big a deal for us. Marko, I need to know most lawyers personally to judge the results of their actions, that I see every day? That's what's preposterous. I may have no idea what I'm talking about, which was after all a sweeping judgement of the majority of an entire profession, but you cannot present any arguments or evidence to the contrary, simply your contrary opinion, so it suggests you can't make your case. ;) If the people who created the bad and multiplying laws are mostly lawyers, as I pointed out already, I am blaming the right people. :) I am in software, and there are many people in my profession who regularly abuse the legal system to extract more money from others. As you can see from the big names outed in that link, most professions are filled with such leeches, who will use any means they feel necessary to maintain their position and leech more money off others. So for you to get "offended" when we simply point out that there are many such leeches in your profession also, just like any other profession, is just silly. Marko- I would like to give your post a plus if it were possible. Agreed Obama has totally wasted everyone's money but people do need to take responsibility for their own money, counting on the market rising and being able to earn more when you sell it? Why is it a bad thing if prices bubbled, that they then return to a more normal level. If you were foolish enough to buy a million dollar house as an investment, you deserve what you got. "So what you're saying is that the lobbying is ethical as long as it's legal? So I.O.W., if a given interest group (let's pick one that you really dislike) lobbies the government, and the group does it within confines of the law (a law, perhaps, that the group itself helped to create), then NOTHING is ever "wrong" or "unethical" or "unfair". I very much dislike the trial lawyers association and would not join. I do not agree with what they are trying to do, I think it is wrong. At the same time, I have risked my life (military) to defend their right to petition the government. That is a fundamental right, and I am not sure why you think it is "unethical" for them to lobby that the laws should be changed in a way that advantages them? I think the KKK has the right to petition the government to bring back slavery, and I don't think it is unethical for them to lobby the government in that way. I do think that slavery is unethical and would oppose that, probably by lobbying the government not to do that, and by voting for representatives that are against slavery, and perhaps eventually by taking up arms if necessary. Again though, I don't think it is unethical for them to lobby the government though. What do you think is unethical about lawyers lobbying the government to change laws? Is it unethical for anyone to do that, or just lawyers? Are we not allowed the same free speech and petitioning the government rights as other citizens? Thanks Susan! I agree with you that prices go up and down, the rule should be caveat emptor. The banks took the risk of buying subprime mortgage tranches (CDOs) without looking under the hood. When those obligations turned out to be bad, they should have suffered the consequences - end of story. Same with borrowers, they were betting when they bought houses as investments with no money down that the houses would go up in price. For a while the bets paid off, and then they didn't. They should pay the price of their own debts. When are people going to realize that the adage that interest rates are a measure of risk is true! Every time there is a chance of an amazing payoff, eventually people get burned. Remember the tech bubble? High rates = high risk, it is as close to a law of economics as you can get, but people don't get it. Jon: "The Taliban's offer could have been a stall, but it's worth pursuing because it could spare us of war, which would save both American life and Afghan life. Nobody would have considered a peaceful alternative like that?" That wasn't an acceptable serious offer, Jon. The delays allowed OBL and Al-Qaeda to abandon their training camps and other locations, and head for Tora Bora, where they couldn't be found. Intelligence sources knew pretty certainly who was responsible for the 9/11 attacks, and where he was. Asking that he be turned over too US authorities wasn't unreasonable. If, as you suggest, the Taliban were interested in self preservation, they could have achieved it by turning over Bin Laden, rather than risking being quickly ejected from power by the world's largest military force,and then they could have gone back to stoning women and hanging gays.
" Get outside your bubble and ask some of your non neocon acquaintances. I bet they would." You have no idea. Your presuming things not in evidence is part of the reason you have such an inaccurate view of the world. It may be comforting to be able to put people and events in nice neat little boxes, but you should avoid the temptation, as it's not serving you well. "The Taliban is made up of humans with the same kind of DNA you and I have." Absolutely, but they have a very different culture than you and I have. They live very much as they did in the 8th century, when life for most people was brutal, and short. If you are a non-muslim, you will convert, live as a second class citizen, or be killed. The Taliban are not your freiends, Jon. "Bombs are falling and they face loss of power or they hand over OBL to a third party." Bombs were not yet falling, but soon would be. They understood the consequences of not complying with US demands. Whether those demands were reasonable or not, is not the issue. They were what they were. "It probably gives you comfort to pretend they are irrational animals, but it's not true." Animals are seldomm irrational, but in any case, you have no idea what gives me comfort. Don't presume to know me. Sprewell: "Jon, your whole narrative contradicts your thesis that people have information hidden from them. If the OBL offer wasn't publicized, how do you know about it, some special Taliban backchannel that you have? ;)"
Jon thinks he has some special insight into the workings of the world that isn't available to the rest of us droolers.